When moving home, careful thought should be given to the transportation of the family pets. Sue Jones had the worry of transferring the family’s boa constrictors, Stacey and Bradley when they moved home recently. “I had to make sure that my hands were kept scrupulously clean when handing the snakes. If you have handled food before touching the snake they may think you are prey and strike. It is also possible to spread salmonella bacteria if personal hygiene is not observed. I’ve learned a lot by reading books and speaking to other snake owners but still I was very wary. I try not to move or handle snakes when they are shedding their skin. It can be a time of stress and the snake may feel upset and unsettled enough to attack. I was told that depending on the size of the snake it needed to be transported in a pillowcase or even a duvet cover knotted securely at one end. The snakes had to be placed into a well ventilated box that had been lined with shredded newspaper. You have to try to keep the temperature constant with the snakes existing environment (21 to 24ºC). I tried to make the move as peaceful and quiet as possible. I made one trip with the snakes rather than packed into the car with the children and our assorted other pets. I was told that our snake’s new home should be ready for them when we arrived at the new house. If this hadn't been possible we were to consider boarding them out for a few days so that the transition from old home to new was as smooth as possible. A good point to remember is to ask at your veterinary practice as they have boarding facilities. If your vet cannot board the snake ask around with breeders and specialist pet shops for guidance. Our snake’s vivarium needed to be set to the right temperature with room to move around. Water had to be available at one end so they could cool off between the varying temperatures of the vivarium. A rough stone or rock helps them when it comes to shedding their skin as they can move against it to aid the removal. I was also told to never assume that you know how to keep a snake. 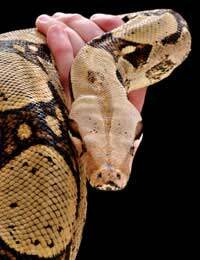 Snakes can be dangerous, some are venomous others like boa restrictors can crush and kill. Young children should not be allowed to play with the snakes but respect them and be accompanied by a parent when in the vicinity of a pet snake. If I’d known a lot of this when the children first wanted to keep snakes I’d have said no! I was amazed how much help is out there for snake owners. Even if you are not travelling overseas there are pet transporters that will help you move your pet snakes, these companies will take the stress of transporting a pet away from the family at a time when we have so much to do when moving home. If in doubt board every pet from cat to budgie so they can join you in your new home and not pick up stress vibes from you and your family. If transporting your snakes overseas speak to DEFRA as there may be certain guidelines in place at the port of entry. We didn’t need to but it’s something worth remembering for future use.